Every team played a total of 5 regular season games at the 2008 IPF-VBC. The 4 teams with the best records advanced to the playoffs. Scroll down for a more complete recap. The teams shaded in orange are the winning teams. A. I want to begin this update by congratulating All 4 One on getting the job done, and winning our first ever volleyball classic! I'll save my game thoughts for my power rankings below. We have lots of pictures on the way, so keep it locked in for those. B. The 1st year of an event like this is always the hardest. So I'd like to thank Becky Kurikeshu & Jenet Poopalan for their help with this year's event. I'd also like the thank Reny Simon, Andrew Samkutty, Teena John, Sony Thomas, Jaison John, Susan Kurikeshu as well as the members of the various teams in attendance that helped us with score-keeping/line judging. If I missed anyone, many thanks. All 4 One: Shout out to team captain Angela Lazarus. All 4 One was pretty talented all around. They had good spikers, setters, and blockers. They also had the assistance of a junior Olympian in Jose! Still it wasn't a cakewalk for them as a few teams gave them a run. Look forward to the return of the defending champs in 2009! NY Shadows: Shout out to team captain Binu Varughese. NY really brought it to the IPF-VBC. They went 5-0 in the regular season, and were the only team to beat the eventual champions, All 4 One. Very talented all around team. What was up with Brary though? Maryland Storm: Shout out to team captains Dilshan Rajagopal and some nut by the name of Chris George. MD Storm had a decent tourney, making the playoffs and giving the eventual champion All 4 One a run for their money in the playoffs. 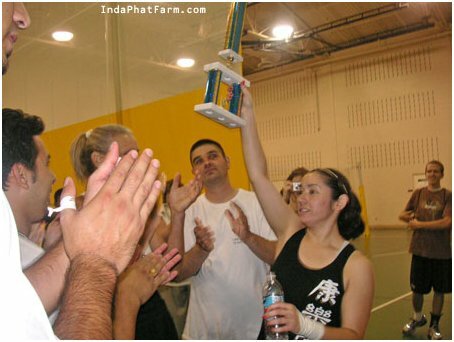 iSpike: Shout out to team captain Becky Kurikeshu. iSpike had the most energy of any team there, with all the chants, "BOOYAKASHAAA" Haha, what? They also had the best fan base come out. Look forward to their return in 2009. North of 42: Shout out to team captain Jenet Poopalan. This team had the longest journey and gave the eventual champion All 4 One a run for their money. Look forward to seeing you guys in the future! MOCOYOGRO PANTHERS: Shout out to team captain Tim Carkhuff for bringing this squad out. Come out and do some damage in 2009!